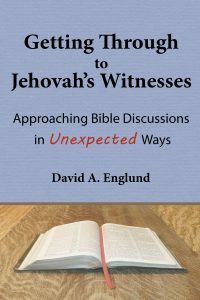 Last time, I gave you brief descriptions of what’s in each of the four chapters of Section 3 of my book, Getting Through to Jehovah’s Witnesses: Approaching Bible Discussions in Unexpected Ways. Now I’d like to give you a preview of Section 4. This section focuses on Watchtower signature issues—that is, issues that Witnesses believe set them apart from the false religions of Christendom. They often initiate discussions of these matters in order to try to persuade us that the Watchtower religion is the only true Christianity. Here are short summaries of what each of those chapters includes. This doctrinal chapter points out that Jehovah’s Witnesses often catch Christians unprepared and place us on the defensive in nine areas: (1) the name of God, (2) war, (3) birthdays and holidays, (4) paid clergy, (5) collections, (6) the cross, (7) hell, (8) blood transfusions, and (9) 1914 and Armageddon. It sets out clearly the differences between the Watchtower and Christian beliefs on these matters. In this chapter, I advise you not to introduce these topics into the discussions but rather be prepared to respond when Jehovah’s Witnesses insist on bringing them up. You will surprise the Witnesses by expressing approval regarding using the name “Jehovah” when referring to God and will then proceed to ask them to comment on New Testament passages which focus instead on the importance of the name of Jesus. The approach concludes by showing the Witnesses John 5:22-23, which demonstrates that the Father and Son are not in competition and, in fact, that the Father wants us to honor the Son to the same extent that we honor the Father. The objective of this approach is to get Jehovah’s Witnesses to think for themselves instead of simply accepting whatever the Watchtower says. The chapter explains how to handle five issues that Jehovah’s Witnesses often insist on bringing up in order to portray Christian churches as pagan—war, birthdays and holidays, paid clergy, collections, and the cross. Rather than arguing with the Witnesses, you will side with them by defending their right to follow their convictions in these matters but will also show them that the Bible allows Christians freedom to differ on these issues depending on the individual’s conscience. By leading Witnesses to think for themselves on these topics, you will be making important strides in helping to break the control the Watchtower exercises over them. The objective of this approach is to show Jehovah’s Witnesses that the Watchtower’s everlasting-nonexistence-of-the-wicked doctrine is neither just nor biblical. Witnesses are trained to put Christians on the defensive with regard to the doctrine of hell. Instead, you will do the unexpected by asking the Witnesses to show the justice in a system which metes out the same punishment to an unrepentant petty thief as it does to Adolf Hitler. You will then show them statements by Jesus in which he declares that there are gradations of punishment for the wicked and will ask them how this is consistent with the Watchtower’s annihilation teaching. The chapter concludes by explaining in detail how to respond point-by-point to the Watchtower’s figurative interpretation of Jesus’ account of the rich man and Lazarus. The objective of this approach is to show Jehovah’s Witnesses that the Watchtower is not Jehovah’s channel of communication (as it claims to be) as shown by the fact that it has made radical changes in its teachings regarding life and death health issues. Rather than arguing with the Witnesses about their blood transfusion ban, you will show them documentation that the Watchtower has completely changed its teachings on the acceptability of having vaccinations and receiving organ transplants and taking blood fractions. You will use this evidence to challenge the Witnesses to consider why they would make life and death decisions for themselves and their families based on such radically changing Watchtower directives. In the event that Witnesses insist on giving you their reasons for refusing to take blood transfusions, I set out their arguments and give you what I consider to be the best responses. The objective of this approach is to show Jehovah’s Witnesses that the Watchtower organization is not the reliable guide it claims to be in that it has made numerous false prophecies. This approach will begin—not by accusing the Watchtower of anything—but by talking about Harold Camping, a man who never was a Jehovah’s Witness. He incorrectly predicted the rapture would occur in 1994 and later changed the date to 2011. Expressing concern about any religious person or group that announces dates for the end, you will ask the Witnesses’ help in examining the Watchtower’s record on such matters. After showing them failed Watchtower prophecies regarding 1914, 1918, 1925, and 1975, you will ask them to consider whether the Watchtower organization really speaks for Jehovah God and with his authority as it claims to do. I’ll discuss Section 5 next week.